Despite being first showcased in May, Pininfarina's Antares has just slipped across our desks -- and frankly, it's a concept too gorgeous for us not to share. 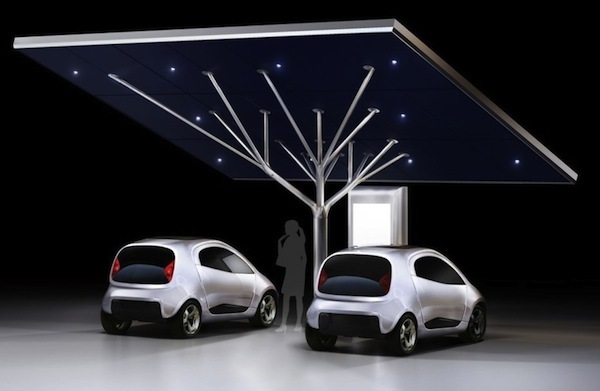 The beautiful tree-like structure -- comprised of steel and aluminum -- supports 20 photovoltaic cells, which the Italians reckon can produce up to 4.6 kilowatts, or just about enough juice to top up two fifty-mile range EVs. That's the plan anyway; we'll supposedly know more later this year, but given Pininfarina's past EV efforts, maybe not. Either way, consider this our formal pre-order request for two -- they'd look perfect right outside Engadget HQ. Pininfarina's stunning tree-shaped Antares EV charging station should be more than a prototype originally appeared on Engadget on Wed, 22 Jun 2011 05:24:00 EDT. Please see our terms for use of feeds.